Whew! I think that’s the longest I’ve stayed away from this blog. I was camera-less this past week so instead of posting I was sewing. Which means I have lots to show you and lots of posting to do. Your going to be so sick of me……so lets get to it! 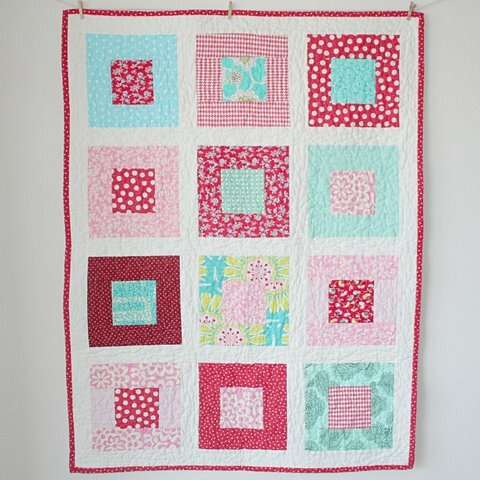 First the red, aqua, and pink quilt. Just because I love these colors and I had the fabric. And It was snowing outside. I pieced the back, but forgot to add the picture, nothing you haven’t seen before though. Second is this bright and cheery little number. It makes me happy just looking at it. And gave me a good reason to cut up some of that blue/green Erin McMorris flower I wasn’t sure what to do with. This is the disappearing 9 patch pattern, except I started with 7″ blocks instead of 5″ so it shows of the big fabric prints. 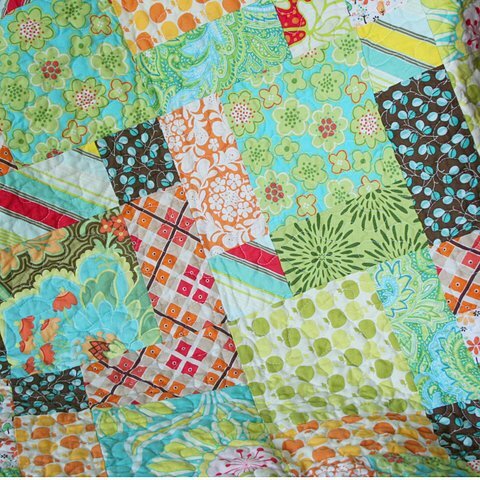 It will give you 5 big nine patches, which you cut to make 20 blocks, and sew four blocks across by 5 blocks down, it made it 35″ by 42 1/2″ after washing. Third is this zig zag. I added a border to make it bigger and spent an hour staring at it deciding whether to take it off or not. Ultimately I left it, its busy and bright, but happy and colorful and its growing on me. That’s probably enough to stuff into one post. But there will be more. I told you, you are going to be sick of me! 11 Responses to Back and busy..
Nope! Never sick of your posts! I look forward to seeing what’s new :) It’s eye candy and motivating! Love them all! 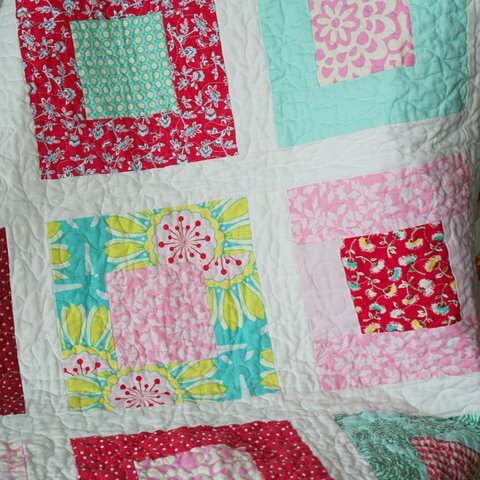 Not sick of you or the pictures of your wonderful quilts. Keep ’em comin’. Just found you in blogland! Love your style and your ideas. Going to add you to my favorite blogs to visit. Thanks for sharing and giving me some inspiration. 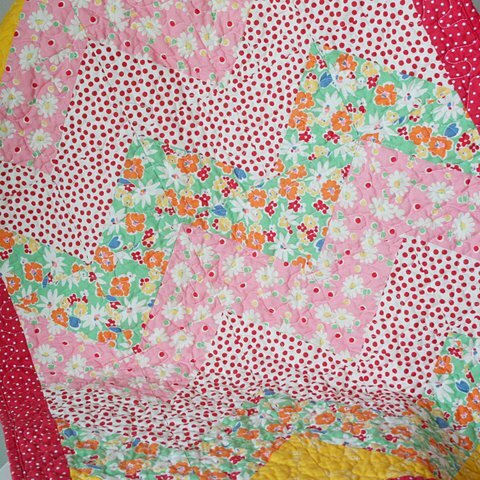 I’ve got a baby quilt about 2/3 done and will probably finish this weekend and post about it next week. So check back in with me if you’d like! How could we get sick of your glorious colors in inspired combinations? Just glad you shared! 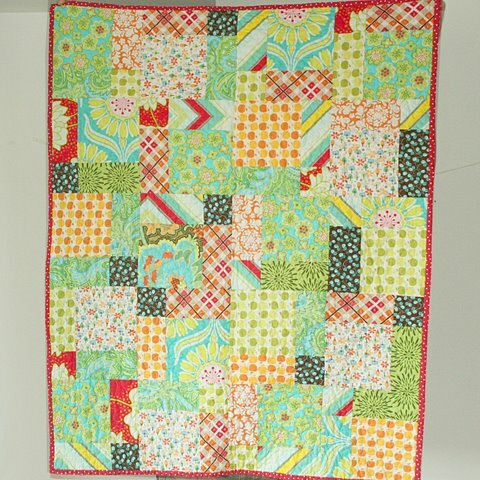 I LOVE that green fabric with the little orange flowers in the zig zag quilt. Where did you get it, and who is the designer?? Wow – they are all great, but I LOVE the pink, aqua & red one. That color combo is awesome! All are beautiful! 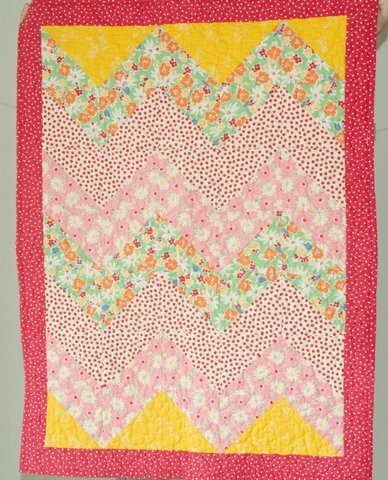 I recently finished a baby quilt similar to your top one. Not sick of your posts at all. In fact, keep ’em coming!! The quilts are awesome! I had a hard time picking which one I loved the most!! But I’m pretty sure it’s #2. See being w/o a camera isn’t so bad! Your blog is darling. Your work is beautiful.